I can’t say enough about how fabulous Traveler’s Joy is! 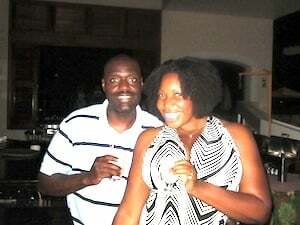 My husband and I went to Negril, Jamaica and stayed at the super inclusive Breezes Resort for our honeymoon. Now mind you, Negril was not exactly our first choice for a trip, but my husband’s cousin was having her destination wedding there a few weeks after our wedding, so it just made sense. We both agreed, however, that we were not staying at the same hotel as the wedding party. I mean we had to make our honeymoon about us, right? We chose Breezes because it was close (but not too close) to the wedding party accommodations. I am so glad that we made that choice. Our resort was far better than the wedding party resort as it had better food, a more relaxed atmosphere and awesome activities. But the best part was that thanks to Traveler’s Joy, we were able to do it up to the maximum. The truth was that we didn’t get an enormous amount of gifts on the registry. Many of our older family members had no idea what a honeymoon registry was and they didn’t really trust things “on that dang internet” and just gave us cash. Our younger friends and family loved the idea, but just didn’t have as much money to give. So, we wound up with about $900 of extra spending money for our trip. That may not sound like a whole lot for two people on vacation, but it helped us immensely. The entire package cost about $3,500 total and included food, drinks, many activities, plus airfare. About a week before the trip, we received our check from our gift registry, which was quite exciting. A day before the trip, we were able to check in for our flight and low and behold, we discovered that an upgrade to first class was only $50 per ticket. So of course, we used our Traveler’s Joy money for that. I surprised my husband at the airport with it. I must say he loved his FIRST first class flight! Once we got going, we were literally able to put our wallets away. Our resort gave us a free upgrade to a beachfront room. The catch was that it was the clothing optional beach. But hey, we didn’t mind. We actually got used to seeing the morning snorkeling excursions (Oh, the sunburns that we witnessed)! Our Traveler’s Joy gifts really helped us because Breezes is a super-inclusive resort. This means that everything is included in the price, including food (which was fabulous), alcohol, and non-motorized watersports. So we used our Traveler’s Joy registry to do all of the things that we normally couldn’t afford. We swam with dolphins, went parasailing, went shopping (and brought back lots of blue mountain coffee), enjoyed jet-skiing, got massages – basically everything our hearts desired. It was no problem stretching our cash since it was the low travel season and there were discounts on everything. For instance, a 60-minute deep tissue massage was $30. You know that is a deal! Our favorite day included a private taxi tour to the mountains. Most taxi drivers double as tour guides in Negril. We lucked out and got the best ride ever. 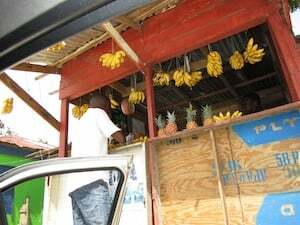 I told the driver that I wanted a taste of the real Jamaica. He replied, “No problem, mon,” which seems to be everyone’s favorite phrase out there. We drove to this water source in the mountains where we ate mangoes right off of the trees, picked and roasted fresh breadfruit, picked fresh lemongrass to make tea, picked young coconuts and sliced the top to drink it’s water, then picked up some baby pineapples, fresh sugarcane, and bananas from his girlfriend’s fruit stand. That was the best day of the entire trip. We would have never been able to pay for that if it weren’t for our Traveler’s Joy gift! Overall, we had an amazing time in Jamaica. It’s going to be time to get another gift registry together because we’re pregnant! Indeed, just six short months after our Honeymoon, we are now expecting. It would be great to squeeze in another fabulous trip before the baby is due. I will definitely be putting Traveler’s Joy on the baby shower invites. I mean, why not? It really helped to make a nice honeymoon AMAZING! It was so nice to not worry about the extra costs of the things that you want to do but shy away from because of the prices. In addition, it was really great to be able to share our trip in such a special way with the friends and family who contributed.